ShredIt is an efficient and easy to use computer privacy application which enables you to permanently erase from your hard drive all your sensitive data, files and folders. The files erased with the aid of this program can't be recovered by any means. The application helps you easily erase your files. All you have to do is to drag and drop the file on the program's icon, and the file data will be automatically erased. 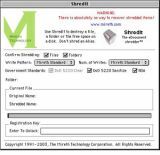 ShredIt is able to erase any type of files and data. Moreover, you can use the program to erase files on your local drive, external hard drive, floppy disk, USB flash drive, and much more. The program offers step=by-step instructions which will guide you through the entire process. A progress bar will display the status of your tasks. ShredIt comes with several integrated safety features, preventing you form accidentally shredding important files. The program also offers comprehensive documentation which will help you quickly get accustomed to all the included features and functions. In addition, the program offers a series of overwrite options which are complaint with the NSA, US Department of Defense, and Gutmann shredding standards. The application includes a series of safety features. The utility is able to erase data from any type of media. ShredIt has been tested by Download82.com team against viruses, spyware, adware, trojan, backdoors and was found to be 100% clean. Our editors will recheck this software periodically to assure that it remains clean.